The fastest and most powerful road-approved 911 is ready for launch: The new Porsche 911 GT2 RS will celebrate its world premiere at the Goodwood Festival of Speed in the UK (June 30 to July 2). At the heart of this high-performance sports car is a 515-kW (700-hp; combined fuel consumption: 11.8 l/100 km; urban: 18.1 l/100 km; extra-urban: 8.2 l/100 km; CO2 emissions: 269 g/km) biturbo flat engine. Weighing in at 1,470 kg with a full fuel tank, the lightweight two-seater accelerates from zero to 100 km/h in 2.8 seconds. The rear-wheel drive Coupé has a top speed of 340 km/h, and with its near-motorsport drive technology, the new 911 GT2 RS trumps its 3.6-litre predecessor by 59 kW (80 hp) and achieves a torque of 750 Newton metres (an increase of 50 Nm). The engine builds on that in the 911 Turbo S at 427 kW (580 hp; combined fuel consumption: 9.1 l/100 km; urban: 11.8 l/100 km; extra-urban: 7.5 l/100 km; CO2 emissions: 212 g/km). In order to increase performance, large turbochargers push an increased volume of process air into the combustion chambers. A new additional cooling system delivers optimum cooling at peak loads and, at very high temperatures, sprays the charge-air cooler with water. This causes the gas temperature to fall in the overpressure range and ensures optimum power output, even under extreme conditions. The customised GT seven-speed double-clutch transmission (PDK) in the new GT2 RS enables power to be transferred with uninterrupted traction. 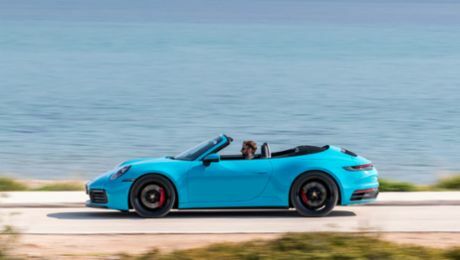 What’s more, the specially developed exhaust system is made from extra-lightweight titanium, weighs around seven kilograms less than the system used in the 911 Turbo and delivers an emotional sound without precedent. Performance can always be cranked up a notch – even on the 911 GT2 RS. That’s why the Porsche engineers have developed the optional Weissach package, which provides a weight saving of around 30 kilograms. The package includes additional elements made from carbon-fibre reinforced plastic and titanium. For instance, the roof and the anti-roll bars are made of carbon, and so are the coupling rods on both axles. Magnesium wheels reduce both the gross weight and the unsprung weight, providing a greater wealth of impressive chassis properties. The luggage compartment lid and the carbon- weave finish roof are emblazoned with a central strip in the same colour as the car for a visually distinctive look. Porsche Design has teamed up with Porsche Motorsport to develop the 911 GT2 RS Chronograph for customers of the new super sports car. It is reserved exclusively for 911 GT2 RS drivers. At its heart is the first clock movement developed by Porsche Design, the product of three years’ work. The calibre 01.200 includes a flyback function, a load-path-optimised movement bridge and an official COSC certificate of authenticity. The timepiece housing is made of lightweight titanium.